An interesting story popped up in my Facebook feed a couple of days ago. (Yes, my children have made me aware that Facebook is now so last decade.) The item called attention to the 10th anniversary of the collapse of Lehman Brothers, the former high-flying investment banking house whose bankruptcy presaged the coming of the Great Recession. That got me thinking about how—or even whether—things have changed over the ensuing decade. 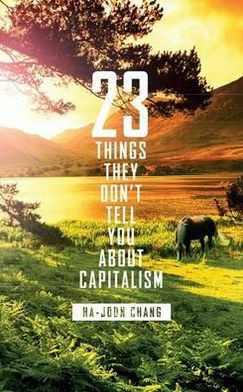 This further led me to think about 23 Things, which, written by a Korean economist at Cambridge University, argues that “none of the causes of the crisis—toxic assets crippling balance sheets, collapse in housing markets, excessive personal and corporate debts—have been resolved.” Though perhaps a bit dated now, many of Chang’s specific points still hold up. One of my favorites, of particular interest to entrepreneurs and would be entrepreneurs, is Thing 21 (“Big government makes people more open to change”). Chang notes that, despite widespread belief to the contrary, entrepreneurial activity in such “welfare state” countries as the Netherlands and Denmark outpaces the United States. This may seem counterintuitive, but Chang notes that a strong safety net makes it easier to take the risks necessary to build a business. In many ways, Chang’s observations make we wonder whether he has a crystal ball, given that he wrote the book some eight or so years ago. “Such is the power of free-market ideology,” he writes, “that people vote for politicians who do things to hurt them.” With everything going on in Washington these days, I’ll just leave it at that. Thanks for sharing this Dave. Another one you might enjoy is Marjorie Kelly's "Owning Our Future" (also a bit dated, but related) in which she posits that there are for-profit business models that do promote a 'generative' economy that works for everyone, rather than the 'extractive' economy that capitalism produces. Coops (and related cooperative principles) factor heavily into this generative approach. It is a key reason we chose it for our company, Collectivity.